Tottenham manager Mauricio Pochettino is no longer the favourite to be the next Manchester United manager on a permanent basis after his side’s defeat to the Red Devils on Sunday. Interim manager Ole Gunnar Solskjaer is now listed as the man in pole position for the job by bookies Ladbrokes, with the former United striker now just 6/4 to get the job beyond the summer. 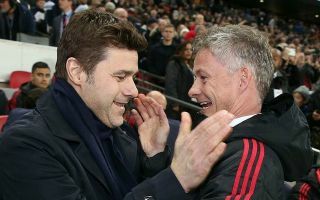 They state Solskjaer’s odds have been slashed following that win over Pochettino’s side, with the Spurs manager now a close second with odds of 7/4 to be the next full time manager at Old Trafford. While the Argentine is more proven at this level, Solskjaer’s connection with United seems to be paying off big time after a superb start to life in the MUFC dugout. The Norwegian tactician has won all six of his opening six games in charge, and got the team playing with a swagger and confidence again that’s arguably not been seen since the legendary Sir Alex Ferguson retired. Ole Gunnar Solskjaer to be next permanent Manchester United manager? So it’s little surprise that Solskjaer may now be the man best-placed to get the job full time.